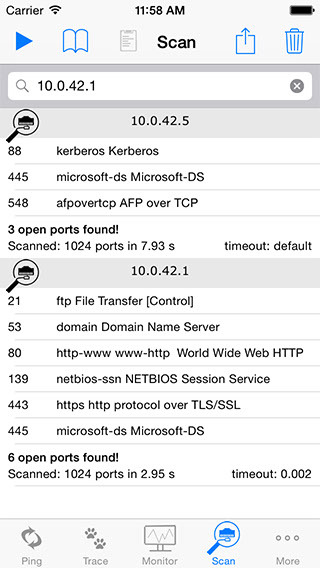 ​Joe`s Network Diagnostic Analyzer Monitor Scanner and Security Utility Professional The network utility Network is the All-In-One tool to help you monitoring, troubleshooting andanalyzing your network. Each tool simply implements the best solution on the iPhone, iPad and iPodtouch.Now also with Apple Watch support. It currently consits of the following tool sets:vFeature overview: - The app has been completely rewritten from scratch to best support IOS 8 & 7 and upcoming features and for supporting all new iOS devices.- Native iPad support added.- The user interface has been completely redesigned now representing a lightweight IOS 8 look & feel as well as being used even more intuitively. All tools are being implemented the best way possible.- Separate Bookmark for different tools.- Super Bookmarks. Bookmarks defined within settings section which are being used if no entry was made- Wake on LAN Bookmarks have been enhanced too, so that they can now be used within different tools- Clipboard has been added to easily use and copy result among different tools.- On the fly settings for being able to changed the most important settings on the fly.- Most tools come with grouped history. 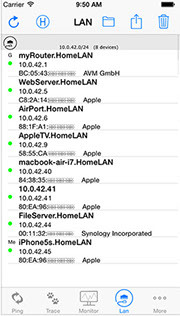 For examle a Pings, Traces, DNS lookup history.- Email history results.- Define of number of packets to send and ttl to be used.- Set individual timeouts definitions.- Traceroute timeout values and maximum path length are adjustable.- Works via Wifi, 3G, EDGE, GPRS, VPN.- Arrange tool order and tool to run at startup to your own preference.- Import your ld bookmarks. If bookmarks of former version of the tool has been found they can be imported within the feature section of the tool. An organize button will be displayed in an apprearing toolbar. Analyze your local area network. See which devices are connected to it. Include information from the past showing new devices or devices not online anymore. 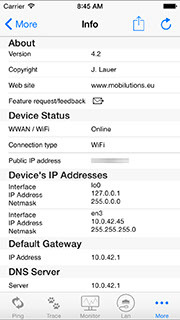 Get more detailes information about devices such as when it was first or last seen. MAC address open ports, etc. Or just use it to easily create bookmarks from your networked devices which is extremely helpful when creating WOL bookmarks with MAC address information. Of course any information can be emailed. 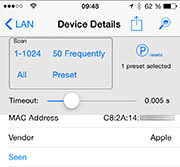 LAN Analyzer allows you to scan your local network you are connected to via WiFi. and registered network interface vendor information. The network gateway/router will be marked with the letter "G". The green dot just marks that the device answered. It will mave a more significant meaning then the history mode is enabled.. The iOS device you are performing the scan with is marked with "Me". By touching the H button in the menu bar you can enable the history mode. It includes history information from past scans and marks them either with a green, grey or blue dot . and answered to ping in recent scan. By touching the device you can show more detailed information about it. The scan button allows you to scan the device for open ports. You can choose between most common scan methods or define and select your own scanning preset. The Ping utility implements a ping application the iPhone way. Each ping session is being displayed logically grouped and each group is named after the ping destination. A ping session can be stopped at any time by pressing the Pause button. 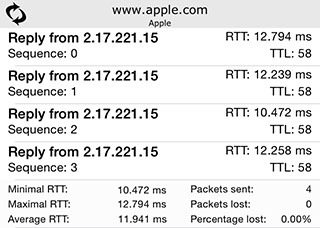 When a ping is being started a predefined number of ping packets are being send to the destination host. Each second one ping packet is being send. 2/4 in the Ping icon mean that ping 2 of 4 has been send. During the entire time the application runs incoming ping answer packages are being accepted. Thus pings can be received after the predefined ping timeout. Pings which are being received with a Round trip time higher than the timeout value are marked with a red round trip time (RTT) value. 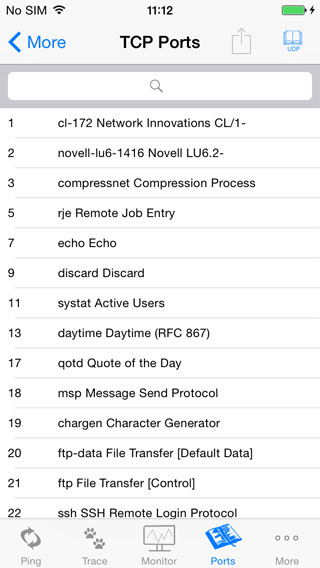 The number of pings being send can be configured in the applications preferences. As well as the timeout parameter. Each ping session started will be added to the display thus creating a history. When you want to clear the history just touch the trash can button. It is only enabled if no ping session is running. If no destination was entered and the „start“ (Play) button is being hit a so called super bookmark is being used. This super bookmark can be configured in the settings section. Just touch as the bookmarks icon to keep track of all your your hosts. To add new hosts just touch the "+ Edit" button and touch the (+) icon in the appropriate section you want to add one. Depending on the bookmarks you are editing or adding the details of the bookmark entry vary. And do not forget to touch save if changes are made. The tool now supports ping ranges up to a /24. This gives you the possibility to find out responding hosts within a xssubnet. Ping groups allow you to create groups of hosts. You now can for example create your WAN, LAN, printer, server ping groups or whatever ping group comes in your mind. 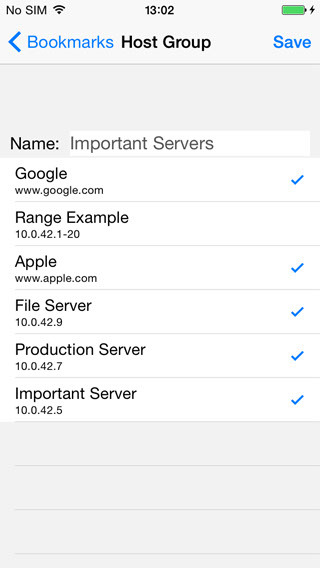 For this host can be selected from the Ping favorite section and associate them to your group. If selected and started all selected hosts are being fast pinged to quickly determine their rechability. 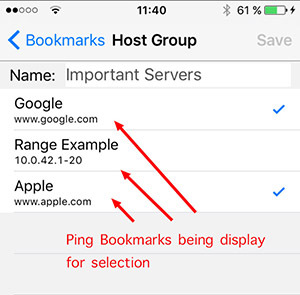 Ping groups must be selected from the bookmark section for usage. You cannot simply enter their name. When using a Ping group and it is being displayed in the input field as soon as the input field is being entered the input field is treated as a normal host entry again and not as Ping group anymore. A group can also consist of a ping range. The Monitor tool allows you to monitor important hosts. 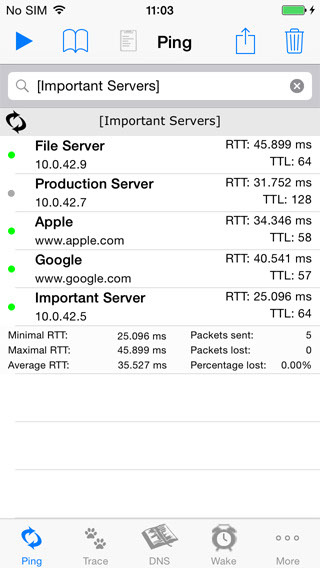 It shows you whether a host is up and down and how fast it replies. Furthermore it keeps a history of the summaries. We monitoring is stopped you can scroll through this list and see when a host went down and when it was up again. The history can also be emailed. To monitor your hosts just select your desired group of host from your bookmark section. 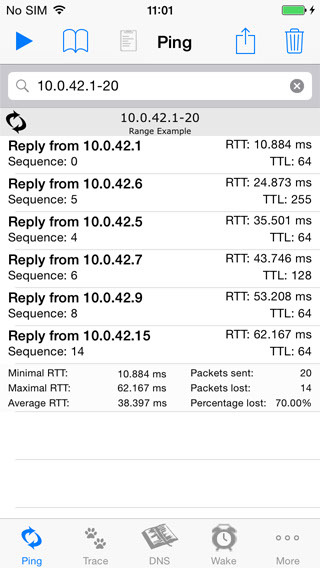 The interval in which pings are send to the host can be adjusted on the fly. 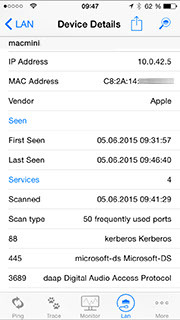 The Monitoring Tool offers special Apple Watch support. You are in an escalation meeting and immediately wanting to know when your important servers are up again. 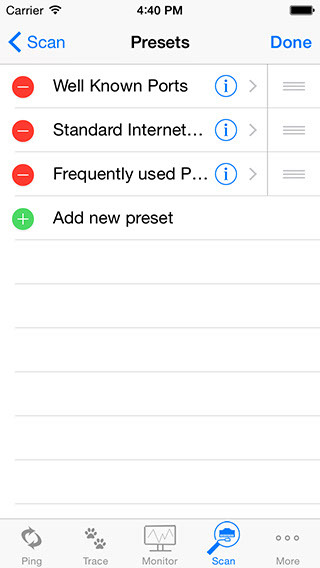 Create a Monitoring group on your iPhone first. Afterwards you can select it and start monitoring from your apple watch. As soon as the monitored device up/down status changes you will get a notification. This notification shows that 2 devices went up and 1 down. Tap the notification to show more detailed information. 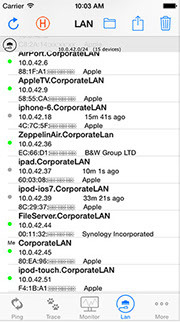 Beyond the monitoring tool the Apple watch also offers some remote control functionality for the network application. Some tools can be started and stopped using the Apple Watch. When it appears it does not know what to monitor and states „Please select Host Group Bookmark first"
If you haven’t created one yet you have to first create one! Host group entries use ping bookmarks! 3.1 If you want to create a host group entry you have to create a ping bookmark entry for each host you want to use first. 3.5 Below the name all ping bookmark entries are listed. 6. you can now select the play button in the top to start monitoring. 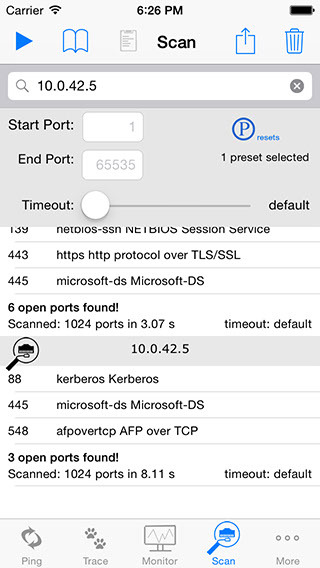 The Port Scanning tool allows you to secure your network by scanning for example servers or important devices for any open ports. 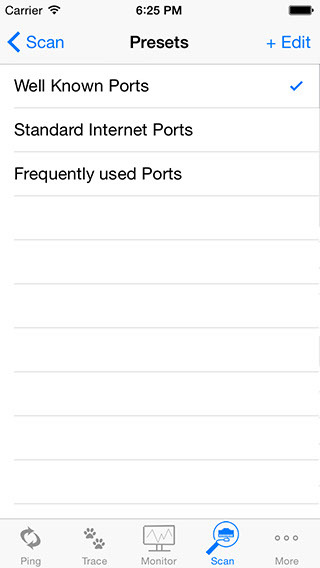 You can scan any desired port range, use predefines port presets or create your own presets. Timeout can be adjusted to your needs for faster scanning. But be aware to shore timeouts may result in incorrect scan results. 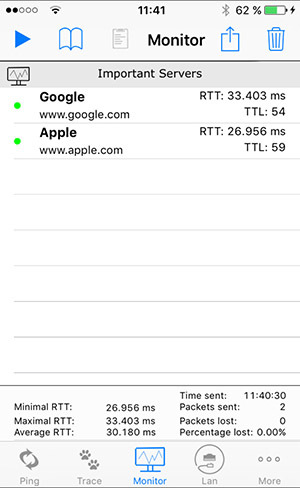 You should test what timeout values suits your own network needs. Please note: when changing on the fly settings or entering new port entries the new input is accepted by hitting return button only. Traceroute determines the path to a destionation (if not prohibited by firewalls). Is has been impelemented for very fast (full version) path determination. 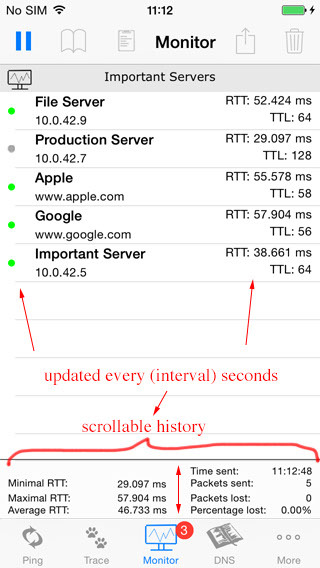 And it automatically performs reverse lookups on any IP address in the path for better readablility and visualization. The first number describes the hop that is actually being traced. And the second number (1-3) the ping which is being send to that hop. 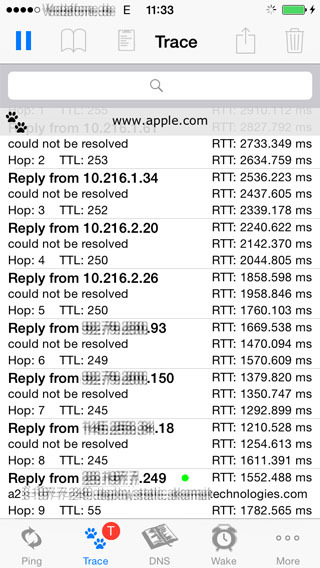 For each hop 3 pings are being send with the appropriate TTL. If a trace started and no results are being displayed despite of the fact that hop for hop is being testet this means that the first hop blocks every returning packet. In every case when a trace finishes either the destination reply is being shown or if the destination does not answer or in the case that his answer is being blocked an "unknwon hop to destination" message is displayed instead. The Domain Name System application looks up either a given hostname displaying it's IP address (es) ,which were delivered by the currently used DNS servers of the device, or reverse looking up an IP address to a hostname. It thus can be used if you need the IP address(es) of a given host's domain name. 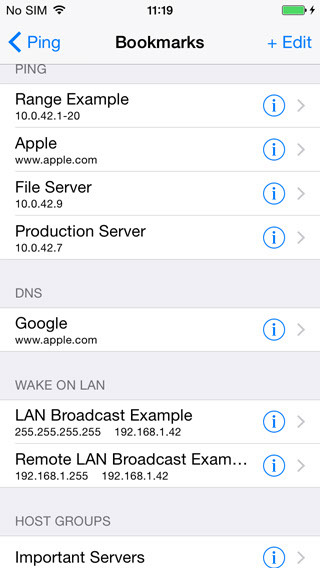 For example if you want to check your dynamic DNS IP of your home VPN gateway. Or if you want to check what name belongs to an given IP address. 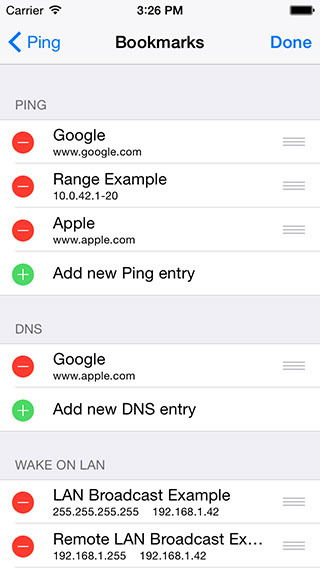 The usage of the DNS application is exactly as using the ping application. You can either enter the name to resolve directly or choose a destination from your favorites list. 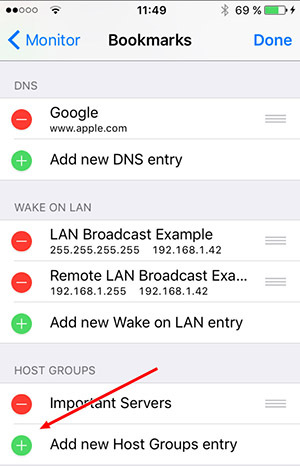 Wake on LAN is the application if you need to wake up one of your devices. Please be aware that the device to be woken up must be configured for Wake on LAN usage and thus must be listening to Wake on LAN magic packets for being woken up. How to configure your end devices for being woken up is not part of this tutorial. Please refer to your devices manufactures references. This is the IP to which the address is to be send. to be woken up is connected to. 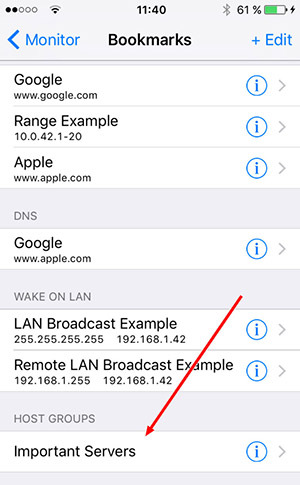 Configure the MAC address of the host to be woken up. You do not need to enter any colon. They are added automatically. If no port has been entered port 9 will be used. 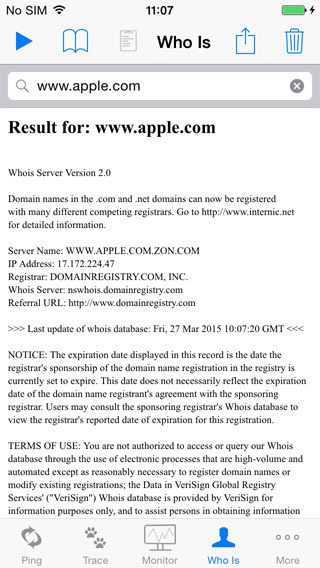 Give you the ability to perfom WhoIs lookups on your IOS device. 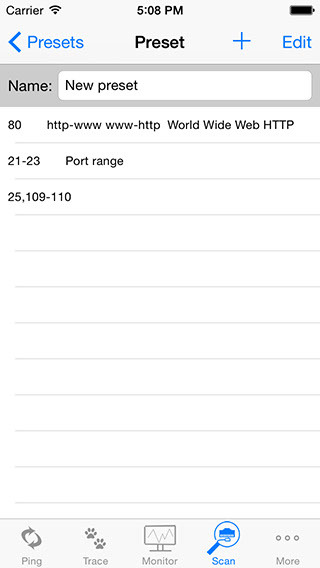 Give you the ability to lookup some well-known ports.